The Kindle Paperwhite just updated to a higher resolution screen for the same $120 price. I probably don’t need to tell you it’s better than the last Paperwhite. It definitely is. It’s 2015. Why would I want an e-reader? At its core, an e-reader is a very simple, single-use gadget. Anyone who reads books would probably benefit from such a device. It saves you space because you don’t have to buy physical books. When you want to read a book, you just download it. And over time, you might even save money because ebooks are often a bit cheaper than regular books. I remember when I first used a Kindle, I was shocked at how much I liked it. I’m still a fan of regular books, but it’s nice to have an alternative when I don’t want to own or lug around a physical copy of, say, Gone Girl. Increasingly, I’ve been reading on my phone—but it’s nice to have a reading surface that doesn’t come with a batch of built-in distractions. For those of you just joining the conversation: Amazon conquered the e-reader competition with the first Paperwhite years ago. There was another Paperwhite in 2013, which was a little better than the first. Last year, Amazon pushed out the Voyage, a $200 luxury Kindle with a higher-resolution screen and a lighter, slicker design. The Voyage is beautiful, but not really worth $80 more than the Paperwhite in my mind. The new Paperwhite makes it even harder to buy a Voyage. It introduces a 300 PPI screen, the same resolution as the Voyage’s delightful touchscreen e-ink display. The two displays are equally crisp. Still, they’re not quite identical. The Voyage has more contrast than the new Paperwhite, and its screen is flush with the bezel. (The Paperwhite’s screen is recessed into the case a tad, which gives it a slightly cheaper feeling.) The other big difference between the Voyage and the new Paperwhite are the page turn sensors on the Voyage’s left and right bezels. Paperwhite users have to actually tap the screen to get the pages to turn, instead of just pressing down on the edge of the case. Voyage owners love these differences. I am a Paperwhite user and they’re not worth the money to me. Besides the new, more beautiful screen, Amazon also updated the typography on all the new Kindles. There’s a new font called Bookerly that’s easier to read, plus a new layout engine that introduces hyphenation for more logical spacing. The new Kindle Paperwhite has cleaner text on close inspection. It’s also noticeable from afar. Is the new Kindle Paperwhite better than the last? I already told you it was! But to elaborate: I’ve owned the previous Paperwhite since day one, and the new version is an immediate and noticeable improvement. In particular, I like that the screen’s lighting is more uniform from edge to edge. A fussy reader will notice that the new display doesn’t pop with the contrast of the old one. I find the new look more inviting. I dare say it’s got a papery look to it. The Kindle Voyage is super fantastic and its display has better contrast than the new Paperwhite. It’s still probably not worth $80 more dollars. 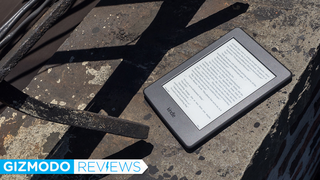 Is this the Kindle you should buy, though? Given the choice between the basic $80 Kindle, the $120 Paperwhite, and the $200 Voyage, the Paperwhite is the obvious choice. Not too hot, not too cold. Just right. Should you upgrade? Do you already have a Kindle? Unless you’re still running around with an ancient slab that’s got a physical keyboard, I can’t really see a reason to buy a new e-reader. Of course, it ultimately comes down to how much you use your Kindle and how desperate you are to spend money. If you’re the type of person who reads constantly, maybe the marginal improvement will pay off with the amount of time you spend on the device. If, like me, you’re on the Kindle an hour a day if you’re lucky, there’s no reason to splurge.